Create a vintage feel with a modern twist with this sleek coffee table, part of JR Home Collection's Pipefitter series. The dark rusted grey is a 3D paper veneer that looks and feels like real wood grain, blending perfectly with the black powder-coated metal tubing for a unique pipe fitter industrial look. Match with other pieces from the set for a cohesive look. An ideal coffee table and a beautiful accompaniment to an armchair or sofa, the Joy Double-sided End Table is a flawless blend of Mid-Century design and modern functionality, perfect for displaying magazines, books, or floral arrangements. The piece features one open drawer for showcasing a prized book or special selection, and a concealed drawer equipped with a cool round knob, great for keeping magazines organized and drink coasters available for guests. Metal legs add a bit of industrial edge and smooth oak adds warmth to blend with any decor. 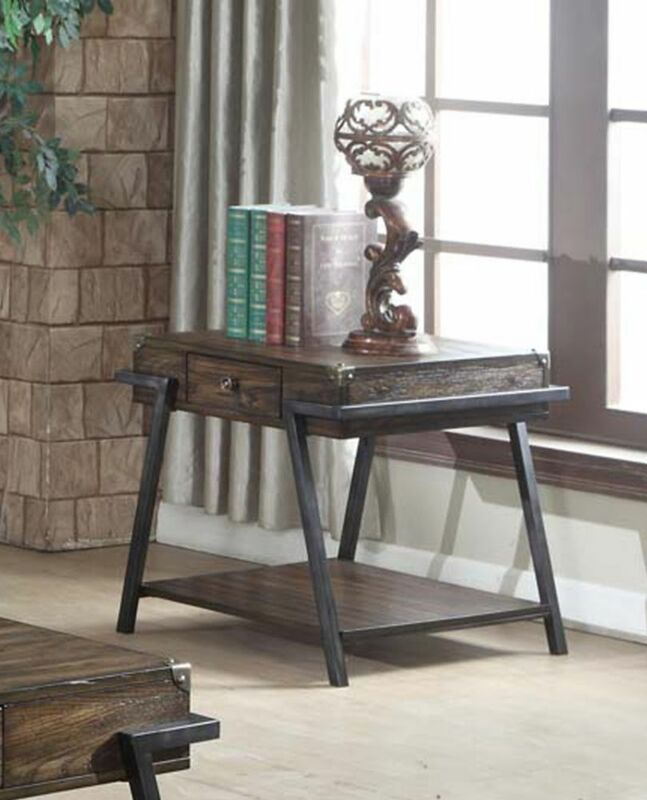 This beautiful grey wood grain finish accent table is a great addition to any living room, family room, or home office. With sufficient surface space for snacks, drinks, or tablet as well as a convenient storage drawer that slides out on either side for remotes, coasters and other accessories, this table is perfect for movie night, snacking in front of the tv or entertaining guests during the big game. The chromed metal base provides sturdy support along with a fashionable touch that will suit any decor. Embellish your living space with this beautifully crafted elliptical accent table. Featuring a thick, bevelled, edge top and middle shelf with storage drawer, this piece will be the focal point of your room. With angled sturdy legs, this dark taupe, reclaimed, wood-look design piece meets all your decorative requirements. Magnum End Table, Dark Walnut Mixing metallic and wooden looks can be tricky business; but in the case of this Magnum coffee table series, the balance achieved is strikingly perfect. Splayed metal legs hug the naturally gorgeous tabletop, with storage drawer, and connect it to a lower display surface. The warm, rich tones in the wood veneer are beautifully contrasted and complemented by metal hardware and accents. Built with high-grade materials, this stunning series will be a lasting favourite.